Looking for something different? 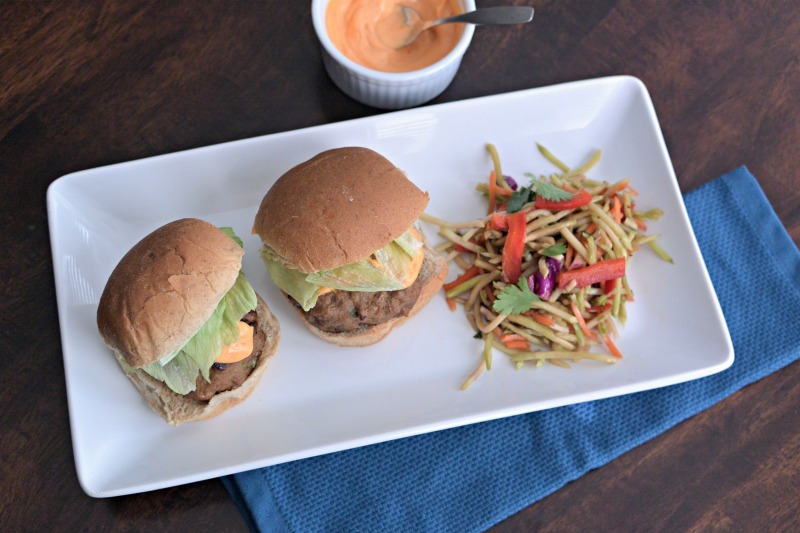 These slider-sized burgers are absolutely delicious and healthy to boot. What I love about these is that typically have most of the ingredients on hand so it’s a snap to throw them together. Preheat broiler and spray rack of a broiler pan with nonstick spray. Combine pre-cut broccoli slaw, bell pepper, vinegar, cilantro, sugar, 1 tbsp of soy sauce, and 1 tbsp sesame oil in bowl, toss to coat. Pop that bowl of slaw into the refrigerator so the dressing chills while you make your burgers. Mix 3 Tbsp mayonnaise with 1 Tbsp Sriracha sauce. (Add more for extra heat, less for flavor but less heat for your picky eaters.) Stir well to combine. Cover and refrigerate until ready to serve. Transfer to broiler rack (or BBQ) and cook 4-5 minutes on each side or until cooked through. The sesame oil makes them really aromatic. These turkey burgers smell good even before hitting the grill, and cooked up moist and juicy. Top them with some lettuce leaves and some Sriracha mayo, add a side of broccoli slaw and you’ve got dinner! Preheat broiler, spray rack of a broiler pan with nonstick spray. Combine pre-cut broccoli slaw*, bell pepper, vinegar, cilantro, sugar, 1 tbsp of soy sauce, and 1 tbsp sesame oil in bowl, toss to coat. *if you aren't a fan of broccoli slaw, you can make traditional slaw with 3-1/2 C shredded cabbage and 2 carrots, shredded. Transfer to broiler rack (or BBQ) and cook 4-5 minutes on each side or until cooked through. Because of the shrinkage from the turkey meat, these should result to the perfect size for slider buns. The sesame oil makes them really aromatic. They smell so good even before hitting the grill, and cooked up moist and juicy. Top them with some lettuce leaves and some Sriracha mayo, add a side of broccoli slaw and you've got dinner! Looking for more yummy recipes? Uhm. Yeah! Come make those for me please??? Or just have me over for supper next time you make them.